Batteries can be used as a horror device, contrary to what many may have thought prior to 1988’s Child’s Play. Those hefty size D’s roll onto the floor and it stops Karen (Catherine Hicks) cold. That dolls she bought for her son from a street peddler is alive without power, and it has killed. It is completely absurd, and Child’s Play weights the film down in realities to lessen the ridiculous concept. Karen in a single mom, struggling to make ends meet at a dead-end retail job. 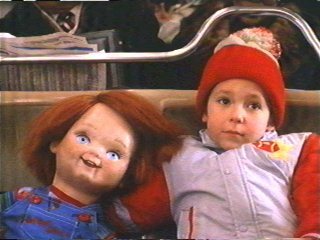 The loss of his father means Andy (Alex Vincent) could be suffering through emotional issues, using his Good Guy doll as an actual friend. Of course, that’s not the case, or Child’s Play would not be listed under horror. Chucky is an icon of the genre, a fantastically realized animatronic puppet with the soul of a serial killer. His evil facial expressions are completely convincing, selling the idea even if the actor (or actress) is rolling around on the floor with an obviously non-animated doll in the next edit. For a simple premise and small body count, the film keeps moving along. Chucky’s first kill is a classic, blasting the babysitter in the face with a Good Guy Doll hammer, forcing her out of the apartment window onto a car below. If nothing else, Chucky can work within his limitations as a doll to reach his sadistic goals, blowing up buildings and utilizing voodoo as intended. Chucky is a bright patch of ‘80s slasher horror, released as cinemas flooded with unnecessary sequels, ironically what would happen to Child’s Play as well. Despite being burned to a crisp, having his head and multiple appendages blown off, and his heart being popped like a zit (in just this movie alone), Chucky kept coming, although explaining it is better left to the Hollywood writers. Trying to comprehend that here would require a novel. Stuck mostly in low light, this AVC encode delivers the film in a marginally sharp transfer. Colors can be especially bold, particularly the striking reds. Flesh tones are accurate, and the grain is held firm with the exception of a few spikes where it appears somewhat noisy. The print used is in excellent shape, whether through restoration or careful handling. Black levels fall into a rather flat pit they cannot pull out of, although image depth is still maintained slightly. Detail is minimal, left mostly to thick sweaters. Chucky’s burned form is impressive, with each dangling piece of melted plastic visible, if not clearly defined. Child’s Play opens with a chase that ends in a massive explosion inside a toy store that sets up this meager DTS-HD mix. Bass is almost non-existent, that explosion coming through muffled and distorted. The same goes for the rundown house later in the film. Dialogue is clean, although mixed lower than the action. The surrounds are used sparingly, but at their most effective during the attack on Chris Sarandon. His car flips, and Chucky runs around circling the vehicle. The audio nicely tracks Chucky’s movements in the rears. Two commentaries offer different perspectives on the film, the first with Alex Vincent, Catherine Hicks, and Chucky designer Kevin Yagher. Producer David Kirschner and writer Don Mancini provide the second. A third (technically) has Brad Dourif in-character as Chucky but for a few selected scenes only. Evil Comes in Small Packages is a three-part making-of that runs for 25-minutes. A follow-up focuses specifically on Chucky titled Making of a Nightmare. The latter two should have been combined, but are excellent regardless. A Monster Convention is an interview panel at Monster Mania 2007. A featurette from 1988 is purely promotional but interesting given how early into the realm of bonus features it is. That is followed by trailers and a photo gallery.